Each set has 1main decal sheet, 2 supplementary, a four page full colour instruction sheet in a resealable bag. Markings for three very interesting and colourful aircraft per set, a full set of stencils, full colour instructions with stencil placement diagram, perfect register and minimum carrier film. I am not sure about the 1/72 scale Kit Recommendations (see text). BarracudaCals is a new decal company from the USA, and from the look of their first batch of releases, they really understand what the modeller wants. There are three Razorbacks on this sheet, all in Olive Drab over Neutral Grey and all with nose-art. The first is a P-47D-1-RE serialed 42-7890 and coded QP-B from the 334th FS, 4th FG, 8th Air Force. It was flown by Lt. Duane Beeson at Debden, England, January, 1944. 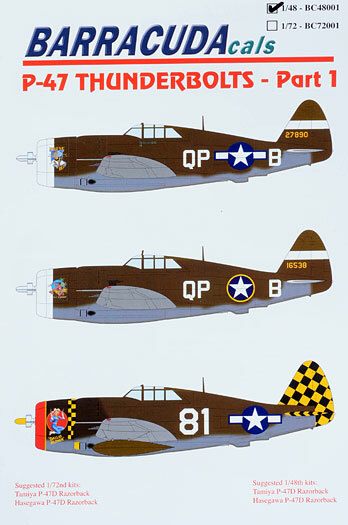 Named “Boise Bee”, with blue and white star and bar national markings in the usual four places, a white cowl ring and white recognition stripes on the rudder and tailplane. Next a P-47C-5-RE serialed 41-6538, it is also coded QP-B and from the same unit, location and time period. Named “Wela Kahoe”, it was shared by Capt. Bill Hollander and Capt. Stan Anderson, and is in the same colour scheme as the aircraft above except that the national markings do not have the bars and the fuselage stars have a yellow ring. “Dallas Blonde”, from the 319th FS, 325th FG, 8th Air Force, is a P-47D (subtype and serial unknown), coded 81 and flown by Lt. Don Kearns, Lesina Italy, early 1944. It has the black and yellow checked tail, red cowl ring and black and yellow cowl flaps and normal national markings. The nose-art for all three is on a separate small decal sheet and the detail is gorgeous even under magnification. The black only of the Black and yellow check is given with the modeller adding the yellow. 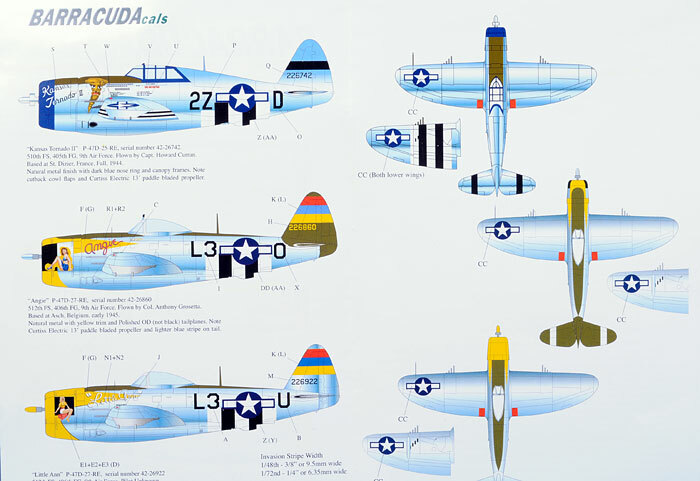 This sheet covers three aircraft also, one Razorback and two Bubbletops, all with natural metal finish, nose-art and D-Day stripes under the fuselage. Starting with “Kansas Tornado II”, a P-47-25-RE with the serial 42-26742 and coded 2Z-D. It was flown by Capt. Howard Curran from the 510th FS, 405th FG, 9th Air Force based at St. Dizier, France, Fall, 1944. With blue cowl ring, canopy frame and ID stripes on the tailplane, it also has D-Day stripes on the underside of the wings. The first of the two Bubbletops is a P-47-27-RE named “Angie”, serial number 42-26860 and coded L3-O, an OD tailplane with three horizontal stripes in red,blue and yellow and a yellow nose. 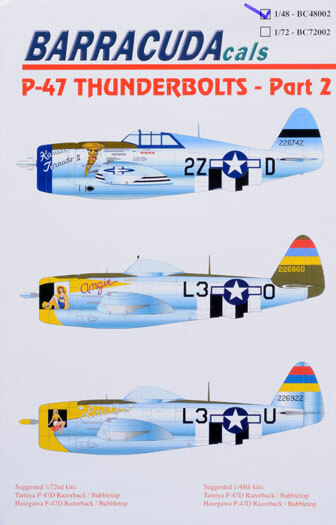 It was flown by Col. Anthony Grosetta of the 512th FS, 406th FG, 9th Air Force at Asch, Belgium, early 1945. Lastly, P-47-27-RE, serialed 42-26922 and coded L3-U from the same unit, location and time as the Bubbletop above. Named “Little Ann”, pilot unknown, it has the same colour scheme as the aircraft above but the tailplane is in NMF with the same three stripes except the blue is darker. All three have an OD anti glare panel on the nose and the two Bubbletops have an OD anti glare strip on the spine. As with Part 1, the nose-art is gorgeous and on a separate small sheet but the D-Day stripes are not provided and will have to be added by the modeller. 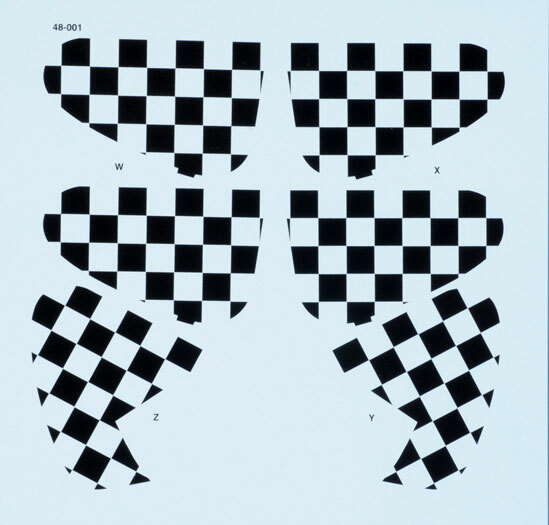 Both sheets have full set of stencils for one aircraft with a positioning guide on the instruction sheet. 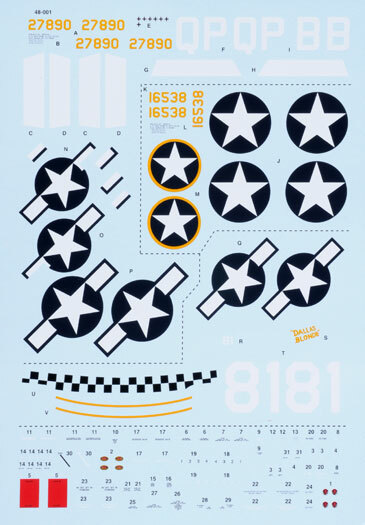 My only adverse comment on these two decal sheets is the 1/72 scale Kit Recommendations. Tamiya I whole heartedly agree with as they are obviously the best Jugs on the market, but Hasegawa? I would have thought both Revell and Academy would have rated higher than Hasegawa as the Hasegawa kits are very old and lack detail. However, I'm not a Thunderbolt expert and perhaps the Revell and Academy kits lack accuracy but I was under the impression they were highly thought of. The above single gripe aside, these decals are top notch, perfect register, colour density and very thin carrier film they simply don't come any better than this. 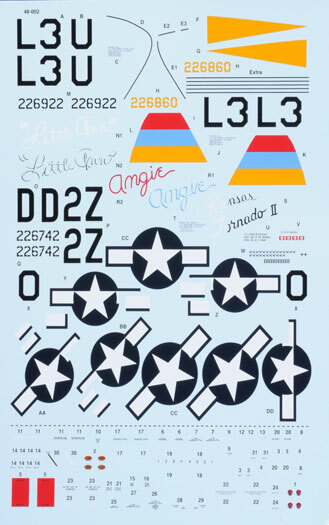 Now, I think I may have to go out and get a couple of Tamiya Thunderbolts just to use these lovely decals.